allround geek: Who, actually, needs a netbook? Who, actually, needs a netbook? Netbooks is a fairly new term that describes sub-12” screen notebooks, with limited processing abilities. A little more than a year ago ASUS launched eeePC. A small factor 9” screen notebook that had one incredible characteristic. It was ridiculously cheaper than any other notebook on the market and especially compared to the ultra portables that cost more than 2000 $. 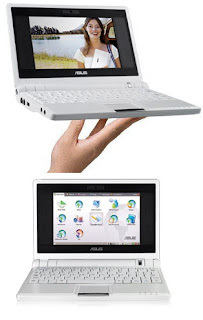 Its success was beyond any analyst's expectation and it actually created a whole new market, the netbook market. I myself find it to be a very nice gadget. But what is its market really? Who actually needs it? The road warriors need a powerhorse laptop to do their job. Using it to simply surf the net on the road, like in a cafe, is probably an overkill since not many people actually do that and, in addition, that need is covered by others means such as smart phones. Surfing the net on the couch is one thing, but who actually does that? Of course a netbook has many other abilities since it is a full blown computer able to play back music, videos, can edit documents and so on. These abilities are found everywhere else as well and people have other computers to do these jobs faster and more efficiently. So what is its purpose. It is certainly not to be a primary computer and maybe not even a second. It is more like a third computer type of product. Few people need a third computer though. So, I ask again: what is its market and its purpose as a product? Netbooks are very-very cool gadgets and for what they are offering, they are very cheap and that is why they are very successful. Beyond having a very cool, do it all, 10” screen, underpowered, cheap laptop for no particular reason I cannot explain it. Struggling to think of some use for it the only think I can come up with is having it next to the bed for some bedtime net surfing in the comfort of my bed. But does this worth the 300 $ I have to spend for that. I guess not but, since, it is actually more of a gadget and less of an actual computer or work tool it does not matter. I am sure that many would have found very handy uses for it but they do not define a raging new market and I am talking millions of units sold here. So what everybody else are doing with it? I still cannot answer the question.